When we started school, oh so many years ago, no one had to explain to us that the human body was not designed to sit in a chair for 8 hours at a time. Somehow, we inherently knew that we needed recess, physical education, lunch, and even naptime. Even that walk uphill, both ways, in the snow, barefoot, was just part of what we needed to do. So we worked all of those years, graduated to our dream job, and ended up sitting in a cubicle for 8 hours without moving. Sure, we use the facilities, maybe go out to lunch, but mostly we sit on our backsides with horrible posture and stare at a computer screen. At around 4 PM, we begin to search for a pick-me-up, and end up eating candy and soda from the break room. Sure, at age 12, we thought free junk food was like winning the lottery. But as adults, we end up feeling flat-out yucky. We vow that tomorrow will be different, but we are so exhausted from a sedentary lifestyle, that change seems impossible. The good news is that a desk job does not have to be so stagnant. If something in motion stays in motion, then we need to find ways to keep moving. And with a bit of food preparation, we can actually avoid the Snickers® bar. 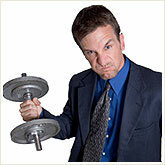 Let's look at some ways to stay healthy at work. Did you realize your phone can be dangerous? No, this is not a lecture on driving with cell phones. Cradling a phone to your shoulder for extended periods of time can actually lead to misalignment, strains, and slipped discs. They still make fancy phones with a cradle for your shoulder, but they don't extend quite high enough. Try a wireless or corded variety of headset, which sometimes can be less expensive than their Bluetooth® cousins. Forty bucks on a headset is better than multiple trips to the chiropractor. Or if what you are discussing is not sensitive, put the person on speakerphone. The coworker next to you might not appreciate it, but your neck will. You can stretch your entire body in a cubicle - a lot of it while sitting down. Here are some stretching options, which will release lactic acid buildup and help with structural alignment. Neck: Lean right ear to right shoulder until you feel a stretch along the left side of your neck, hold for 10 seconds, switch to the other side. Lower chin to chest until you feel a stretch along the back of your neck, hold for 10 seconds. Lift chin toward ceiling, until you feel a stretch along the front of your throat, hold for 10 seconds. Look over your right shoulder, hold for 10 seconds and then over your left. Shoulders: Extend both arms over head, interlace fingers, turn palms, and push up. Then interlace fingers with palms up behind back, lean forward slightly from waist, and lift arms away from your body. Arms: Extend arm straight across your body, grasp forearm, and pull extended arm toward your body. Repeat with other arm. Then sit up in your chair, open your knees, and place your palms flat on the chair between them, with your fingertips facing you, and thumbs toward your knees. Push down on your flat palms. Chest: Lift both arms out to the side, creating a "T" with them. Bend at the elbows, so your hands are going straight up to the ceiling, and you resemble a football goalpost. Pull your elbows back and hold. Back: Sit up as tall as you can, and pull in your stomach muscles to your spine. Extend one arm across to the opposite arm of the chair, and twist. Hold for 10 seconds, and switch to the other side. Quadriceps/Hamstrings: Stand at your desk. Bend one knee behind you, lifting your foot off the floor and catching it with the same hand. Don't lock your supporting leg; hips tucked under, and both knees together. Switch to other leg. Then place one foot on the desk in front of you, keeping the foot flexed and the knee straight. Put fingertips on leg, or desk, and with a flat spine, lean forward. If that isn't possible, flex one foot on floor in front of you, and lean forward with a flat spine. Calves: Stand arms' length away from your desk, both toes facing the desk. Step forward with one foot, and bending the knee, keeping the back knee straight and pushing down in the heel. Switch. Feet: Remove shoes if possible. Stand in front of desk. Form a "V" with your feet, heels together and toes pointed out at slight angles. Bend knees first, then lift up your heels, and hold for 5 seconds. Straighten knees and lower heels. Repeat 5 times. 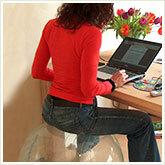 The following office exercise options are chair-based exercises for our more modest readers. If you are less aware of the stare, try adding some push-ups, sit-ups, lunges, dips, and squats to this routine. If you have an office with a door that closes, get yourself a Beachbody workout program right now and skip this entire section. For the following exercises, you'll need an exercise band, like the flat Thera-Band® variety, which can easily be stored in your desk. And if your chair wheels easily, put the brake on now. Chest press: Place band around back of chair, looping the ends of the band in each hand. Sit on the edge of your chair with abs pulled in tight, and straight posture. Press arms straight out in front of you, keeping them parallel to the ground. Hold for 2 counts. Fold elbows in and bring back of hands to chest. Repeat 10 times. Can also be used as chest fly, by slightly bending elbows and bringing hands together in front of you, like you are hugging a tree. Row: Wrap resistance band around the leg of your desk. Sit facing it, both feet on ground, and abs pulled in. Grab one end of band in each hand; bend your arms and slide your elbows back, grazing the sides of your body. Hold for 2 counts, and return your arms to the starting position. Repeat 10 times. Lateral raises: Sit on the edge of your chair, place both feet on the center of the band, and take an end of the band in each hand. Keeping a very slight bend in the elbow joint, bring both arms out to your sides creating a "T" with them. Hold for 2 counts, and lower your arms back to the sides of your legs. Repeat 10 times. Posterior deltoid exercise: Hold band, hands 9 to 12 inches apart. Extend arms straight out in front of you, chest level, rolling shoulders back and down, keeping elbows as straight as possible. Open up arms to your sides, hold for 2 counts, and return your arms to the straight position. Repeat 10 times. Curls: Sit on edge of chair and place both feet in center of band, or wrap band under the legs of the chair. Grab one end of band in each hand. Keeping elbows glued to your sides, bend both elbows and bring hands up toward shoulders. Hold for 2 counts, and lower your hands. Repeat 10 times. Tricep extensions: Wrap band low around desk leg, and face away from it. Reach behind you, grab ends of band in each hand, and extend both hands to ceiling, with thumbs facing behind you. Hold for 2 counts. Keeping your elbows exactly where they are, let elbows bend slowly until hands reach ears. Extend arms straight toward ceiling again. Repeat 10 times. Knee abs: Sit on edge of chair, tuck pelvis under slightly, and draw abs deeply into your spine. Lift your heels off the ground, and lift one knee at a time. For a super challenge, lift both knees at the same time, making sure to maintain a C-curve in your spine (keep your abs firmly tucked in). Repeat 10 times. Leg extensions: Tie one end of band around the base of your chair. Tie the opposing end around your ankle. Sit firmly on chair, keeping backs of legs pressed into the chair. Extend wrapped leg out in front of you until knee is straight. Hold for 2 counts, and lower your leg. Repeat 10 times for each leg. Hamstring curl: Wrap one end of band under leg of desk, up as high as it can go with other end of band tied to your ankle. Sit facing desk, on edge of chair, and extend leg toward desk. Bend knee and pull foot underneath you. Hold for 2 counts, and return to straight leg position. Repeat 10 times, and switch to other leg. An ounce of prevention might be a pound of cure, but 4 ounces of carrot sticks will never be as tempting as that bowl of M&M's® on your coworker's desk. So how do we avoid it? 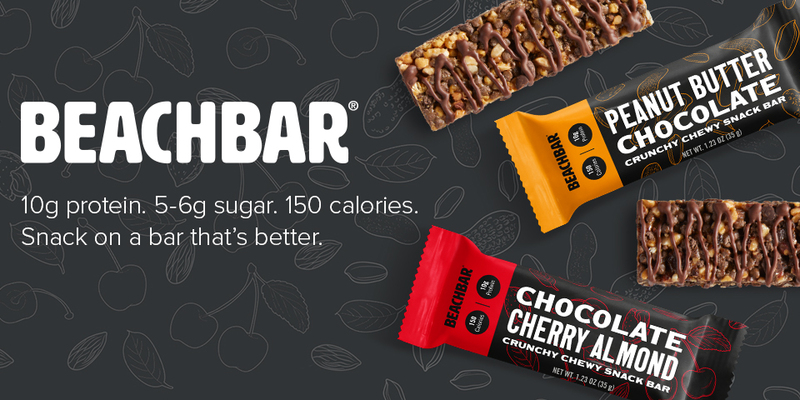 A handful of nuts, a Beachbar, or some low-fat trail mix might not remove the craving, but they'll make your hunger dissipate until your next meal, and they don't require refrigeration. You can keep them in your desk at all times. So instead of the bowl, five M&M's might be enough. Besides the previously mentioned reason to drink water (getting you out of your chair), hydration in an office setting is sorely overlooked. Your body requires a lot of water, even if you're stuck in a chair. Being well hydrated keeps you mentally alert, flushes out toxins from air conditioning, and will sometimes help with food cravings. So drink up. This next tip totally depends on your employer. Most offices have at least a few smokers in them. How come they get to go outside and talk about their weekend, in the sunshine, several times a day? Just because you don't spend 8 dollars a day on cigarettes doesn't mean you can't take a moment and get some fresh air in your lungs. If your boss complains, scream discrimination against nonsmokers. Or you could pick up some candy cigarettes and pretend, as long as you avoid eating them. It is no surprise that the Bureau of Labor Statistics reports 67 percent of the population as being unhappy with their career choices. Is this because we all have chosen the wrong careers? Or is it simply that most office workers would rather be outside playing tetherball? As you are well aware, it's difficult to pay the mortgage unless you go to work. But there are many things you can do, while remaining at work, that will keep you feeling better than a Snickers will. Maybe if we all take a few minutes a day to take care of ourselves, that workplace contentment statistic might drop a little. And if that doesn't work, at least we can avoid the horizontal spread of our back ends. Now that is something to be happy about.